Meningococcal meningitis is caused by a gram negative bacterium Neisseria meningitidis which may be classified into numerous strains and sub-groups according to the antigenic activity of the lipopolysaccharide capsule and outer membrane. Infections with N. meningitidis can take many forms, varying in severity from a mild and transient bacteraemia to septicaemia with or without meningitis. It is also possible to develop meningitis without septicaemia. Otitis media, conjunctivitis and pneumonia caused by the bacterium have occasionally been reported. The early stages of infection are characterised by fever, joint or generalised body pain, severe headache, nausea and vomiting. As the disease progresses there may be altered consciousness, meningitis and the development of a skin rash which may be followed by adrenal haemorrhage, shock and finally fatal cardiac or renal failure. Overall, the mortality rate in confirmed meningitis is about 10% and in patients that survive, neurological and other sequelae are not uncommon. About 3% of patients have permanent hearing loss, 0.5% epilepsy, 3% develop motor disturbances and 1% develop hydrocephalus. 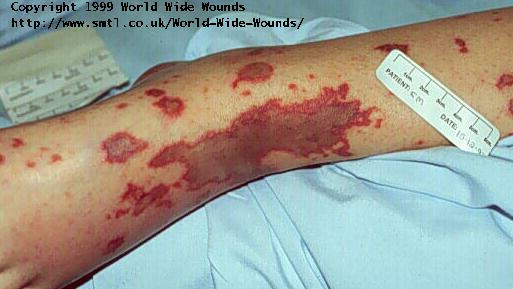 Most septicaemic patients (about 80%) develop haemorrhagic skin lesions(HSL) which vary from petechiae, (defined by Brandtzaeg et al. as circumscribed small areas of intradermal bleeding up to 4 mm in diameter) to ecchymoses, which they define as lesions 5mm in diameter. 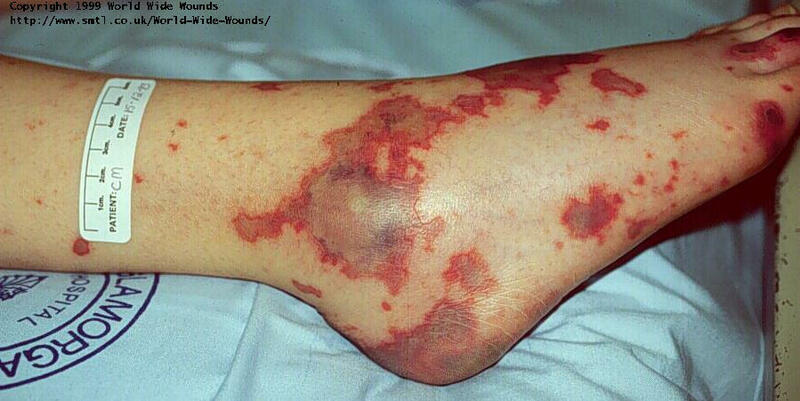 These patchy areas of reddish-blue discolouration most frequently develop on the trunk or lower limbs, sometimes forming vesicles filled with serosanguinous fluid. In severe cases, in the absence of topical treatment, the purpural areas coalesce, darken in colour and eventually become necrotic, leading to extensive tissue loss that may involve muscle and bone  . Large number of lesions or lesions which exceed 10 mm in diameter indicate a poor prognosis. In 15 fatalities of 115 cases reviewed by Brandtzaeg et al, no deceased patient was found with less than 50 HSL. As the skin changes can appear at an early stage in the disease process, their presence may be both an important diagnostic sign and an immediate prognostic indicator. Vaso-occlusion, secondary to disseminated intravascular coagulation, DIC, (the formation of multiple fibrin leukocyte-platelet clots). A suppurative inflammatory response caused by endotoxins that attach to endothelial cells of the vascular tissue resulting in extravasation and the development of the characteristic purple patches. This process appears to be mediated by cytokines, particularly interleukin-12, interferon-gamma, tumor necrosis factor-alpha, and interleukin-1, leading to the consumption of proteins C and S and antithrombin III  . Histological examination of tissue from the margin of a deep lesion reveals oedema and subcutaneous extravasation with ballooning of the endothelium of small vessels and disruption of endothelial continuity of capillaries. Aggregates of platelets appear to fill the lumina of small capillaries while some vessels are completely occluded by red blood cells and fibrin deposition . It has been shown that the endotoxin produced by the meningococcus is 10 times more potent against dermal tissue than any other body tissue  . These site-specific differences in cytokine release by endothelial cells could explain why microvascular changes are limited mainly to the skin, tracheal epithelium and adrenal medulla. Powars et al. performed detailed haematological and coagulation studies on 59 patients with bacteriologically proven septicaemia caused by N. meningitidis. They showed that the severity of the disease correlated with depletion of the naturally occurring anticoagulants protein C and protein S. Children below the age of 4 have lower levels of both of these agents which may explain why they are at greatest risk of developing the severest form of the disease. Powars et al also showed that the risk of death or deformity from meningococcal disease is greatest when the platelet count falls below 50,000 cells/ml and protein C levels fall below 50% of normal values. The consequences of a severe infection can be extremely serious. Lazaro  described a patient with gangrene of the tips of the right index and left middle fingers who was given isoxsuprine in addition to antibiotic therapy in an attempt to improve the peripheral circulation.Surgery was carried out 37 days later to remove the tip of the index finger but the damage to the middle finger was much less extensive than originally thought. This required only minor surgical debridement which resulted in healing without any loss of digit length although scarring on the dorsal aspect of the hand was still present 33 days postoperatively. The author concluded that it is not always possible to judge the degree of tissue damage from an early examination and stressed the importance of a period of observation before proceeding with amputation. The problems of determining the extent of ischaemia were discussed by Hogan et al. , who described the use of MR imaging and MR angiography prior to planned amputation. Genoff  reported that of 6 children with purpura fulminans, the most advanced form of the disease, 5 required amputations ranging from finger amputation on one hand (1 patient), to amputation of all four extremities (2 patients). 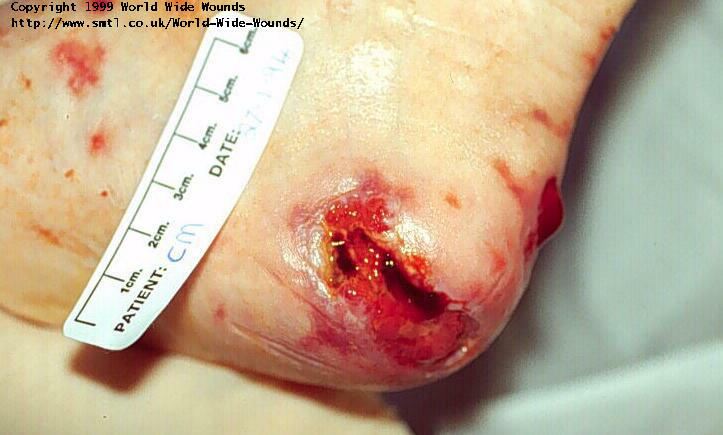 An average of four revisions was required to obtain wound closure in these patients and it was also reported that some patients experienced late deformities due to epiphyseal growth abnormalities. Similar findings to the above were reported by Powars et al , following a review of 113 cases of meningitis caused by N. meningitidis (serotype C). Of 28 patients who developed purpura fulminans, 14 died and 10 of the survivors suffered gangrene with deforming autoamputation. Schaller et al. , reviewed 135 patients 9 of whom died. Fulminating purpura developed in 8 patients, 3 of whom subsequently died. The remaining 5 required a total of 27 operations during initial hospitalisation and 2 required major amputation of parts of their lower limbs. In a 10 year retrospective review of 152 patients with meningococcemia hospitalized at Children's Medical Center of Dallas eighteen (11.9%) of the 152 patients developed purpura fulminans. Thirteen (72%) of the 18 patients with purpura fulminans needed at least one surgical procedure including skin grafts, local debridement, microvascular flaps or amputations. Five patients (28%) died. In possibly the largest and most detailed retrospective review of meningococcal disease yet published, Erickson and De Wals  examined 471 cases in Quebec during the period 1990-1994. Of these, 167 patients (median age 2 years), had infections caused by serogroup B and 304(median age 14 years), by a virulent strain of serogroup C. The mortality rate was 7% in patients with infections caused by group B organisms and 14% in patients with group C organisms. In group B only 3% of survivors had confirmed physical sequelae and impairment compared with 15% in group C, of whom 12% had skin scars and 5%, (13 patients) required amputation. Within this group one patient lost both feet and fingers and thumbs on both hands. Two patients lost both legs below the knee and one lost both lower legs and a forearm. The remainder lost fingers or toes only.Other sequelae included hearing loss and renal problems. A case of a 3 month old boy presenting with extensive peripheral gangrene was described by Fitton et al  . Despite initial treatment with intravenous colloid, hydrocortisone and epoprostenol followed by frozen plasma and platelet replacement, the infants peripheral perfusion remained poor. Within 24 hours of admission he developed irreversible skin necrosis in both arms below the elbow and the right leg below the knee. This resulted eventually in amputation of all three limbs 5 weeks after admission. Early diagnosis and treatment of the disease are crucial. This may be limited to the use of antibiotics such as IV or IM benzylpenicillin in uncomplicated cases but in serious infections, more aggressive treatment may be indicated. Management of the skin lesions tends to empirical and active local treatment is frequently delayed because of the poor condition of the patient who may require intensive medical care . Hyperbaric oxygen has been employed historically for the treatment of skin lesions in the early stages of development. It was reported that repeated exposure to oxygen at a pressure of 15 psi, resulted in complete resolution of cyanotic extremities  . Treatments directed at maintaining tissue perfusion and maximising oxygen transport help to limit damage. To this end heparin has been administered to reduce clot formation, but despite some early successes in the prevention of amputation  , its use remains controversial   . Norman and House  described attempts to improve tissue perfusion and prevent platelet aggregation in a patient with early digital gangrene. They administered infusions of prostacycline and trinitrate and subsequently oral nifedipine. These treatments proved to be of little value although sympathetic blockade using a brachial plexus Marcain infusion and later a transaxillary symathectomy did produce some beneficial effects. Sometimes, however, the desire to improve tissue perfusion may conflict with the more urgent requirement to maintain blood pressure in a critically ill patient. The potential problems associated with the use of peripheral vasoconstrictors in a patient with ischaemic necrosis have been discussed previously . Other specific therapies that have been used for meningococcus-induced purpura fulminans with apparently good effect include recombinant tissue plasminogen activator  , and intravenous protein C   .
Most patients with advanced HSL are referred for a surgical opinion once the medical emergency is passed. By this time the areas of purpura have generally become completely devitalised. Schaller et al., placed 8 patients with fulminant meningococcaemia in protective isolation and managed the skin lesions like full thickness burns - dressing with silver sulfadiazine once the skin began to break down. When the purpuric areas had progressed to obvious necrosis, surgical excision of skin and underlying tissue was performed in a staged manner. After the first excision the wounds were covered with porcine xenografts which were replaced at least one with further debridement as required prior to autografting. A similar surgical approach involving excision of necrotic tissue and coverage with autografts for a patient with meningococcal sepsis was described by Arevalo et al  . The problems associated with grafting meningococcal lesions have appeared in the literature. Adendorff et al. described the poor take of primary split-thickness skin grafts on what appeared to be clean wounds after surgical debridement and Huang et al. similarly reported that skin grafting is complicated by contaminated and contracting wound areas. These workers also concluded that cultured keratinocytes were too vulnerable for this indication. Although it remains common practice to leave purpural areas to dry out and demarcate prior to surgery, Fitton et al argued that as oedema and haemorrhage play an important role in the propagation of ischaemia, the resulting rise in compartment pressure will extend the area (and presumably the depth) of damage. They suggested that an escharotomy performed before the development of demarcation in these cases may improve the prognosis for limb preservation. The relatively poor cosmetic result achieved by managing purpural lesions with conventional dressings including silver sulphadiazine and gauze was reported by Lester  , who described the need for compression therapy to control resultant hypertrophic scarring. 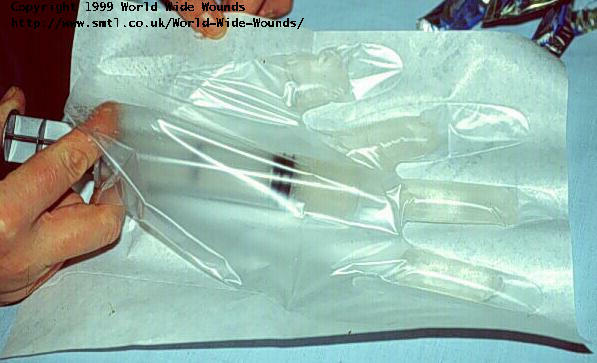 A review of the literature provides little practical advice on the conservative treatment of HSL or any evidence to support the use of modern dressings which provide a moist wound environment, generally regarded as a pre-requisite for rapid, uneventful wound healing. Chris, a pseudonym, a previously healthy sixteen year old schoolgirl, was admitted to hospital on December 12 by her G.P. She had complained of feeling generally unwell for two days previously with a sore throat and joint pains but the evening prior to admission she had developed purpuric macules on her arms, legs, buttocks and feet. Upon admission she was conscious, apyrexial (36 oC), with a haemoglobin of 21g/dl (normal range 12-16). Her white cell count was 8.4 x103/ml (4-11x103) and her platelet count 164 x103/ml (140-400 x103). In hospital her condition deteriorated rapidly and she became agitated and comatose. Her haemoglobin dropped to 7.5g/dl, the white cell count fell to 3.6 x103/ml and her platelet count, at 55 x103/ml, was only marginally outside the critical range identified by Powars . Her prothrombin time was 22 seconds (12-16 seconds). Benzylpenicillin (2.4 grams) and Cefotaxime (2 grams) were administered intravenously following a presumptive diagnosis of meningococcal meningitis. This was supported by a lumbar puncture that revealed the presence of gram negative diplococci with a high white cell count. When Neisseria meningitis was isolated the diagnosis was confirmed. Chris was transferred to the intensive care unit where she was ventilated and given two units of blood and two units of platelets. A left sided chest drain was inserted because of a pneumothorax and she also required a tracheotomy. For the next few days she remained very ill after which she gradually began to improve and by December 15 she was able to respond to verbal stimuli. During this period she was nursed on a dynamic mattress and turned two hourly to prevent pressure damage. On initial assessment she was found to have over 50 lesions of varying size all over her hands, feet and limbs. The largest areas were on the elbows, heels and dorsum of the feet (Figure 2) and (Figure 3) but her fingers, particularly around the joints were also affected (Figure 4). 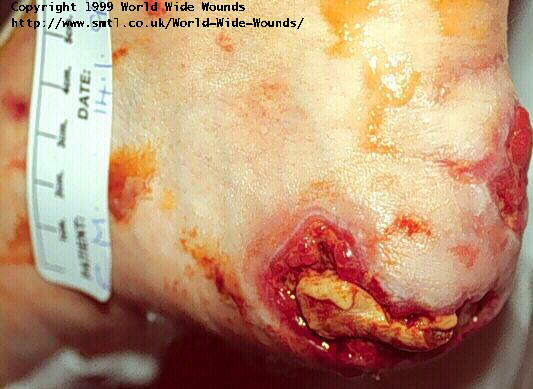 Once the medical emergency had passed, the wound care team were contacted for advice on the management of her HSL. 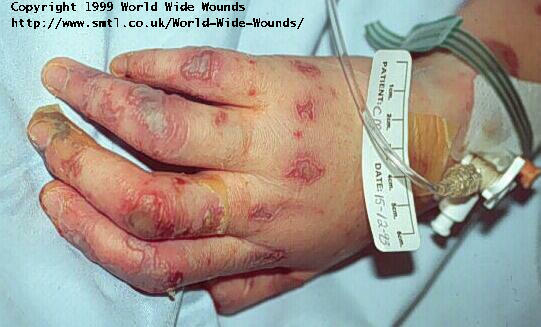 The majority of these lesions had until this time been left exposed to the air, although the wounds on her hands had fortunately been dressed with a thin hydrocolloid sheet by the ITU staff. Figure 2: Lesions on the dorsum and heel of the right foot. Contrary to the usual practice of allowing these areas to dry and demarcate, it was decided to treat all the lesions with dressings that would rehydrate the tissue and prevent these changes from occurring. The rationale for this is that it is believed that between the devitalised and surrounding healthy tissue, is an area of damaged tissue, the fate of which will be determined by the treatment provided. This region is analogous to the zone of stasis that has previously been identified in burn injuries. This was most conveniently achieved by first transferring the gel to a syringe and using this to introduce the gel into the fingers of the glove. The recent introduction of hydrogels in containers with applicator nozzles should greatly simplify this process. Figure 5: Introducing the hydrogel into a glove. 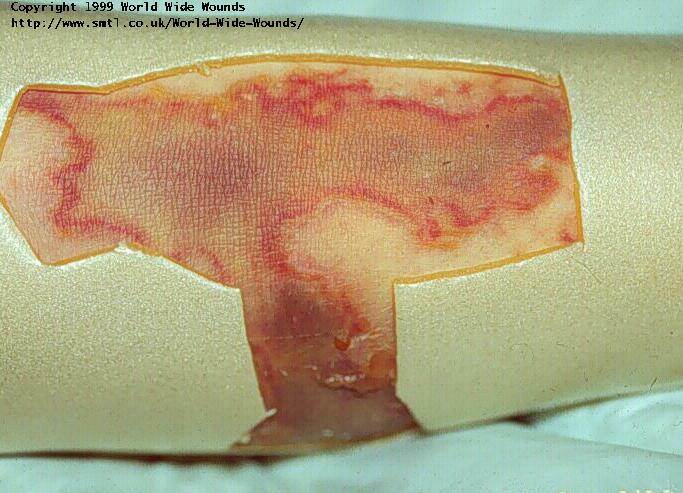 Figure 7: The wound remains visible through the dressing. When used in this way, the gel fulfills several important functions. 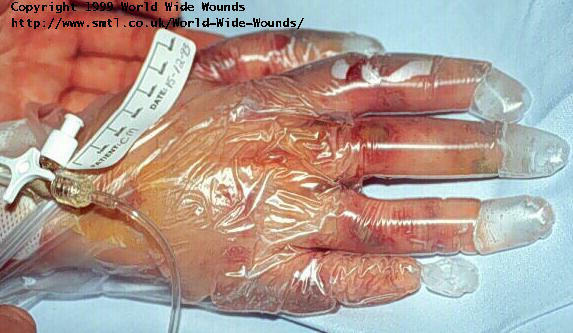 the transparent nature of the gel and the plastic glove permits frequent inspection of the wound (Figure 7). the dressing system allows a reasonable degree of movement of the fingers. The hydrogel dressing was also applied to the extensive area of necrosis on the dorsum of the left foot. A hole the size and shape of the lesion was cut in a hydrocolloid dressing, (Granuflex - Convatec) and applied to the surrounding skin to form a shallow chamber which was filled with hydrogel and covered with a semipermeable film to complete the dressing. 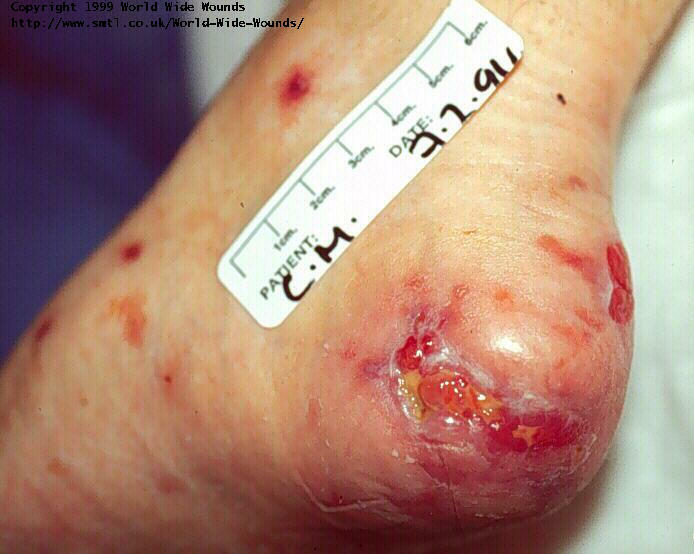 Figure 8: Lesion on dorsum of foot with hydrocolloid dressing in position prior to application of hydrogel. As before, the transparent nature of the gel allowed the wound to remain visible at all times. The affected toes were similarly dressed with the hydrogel and a semipermeable film dressing. All other areas were dressed with hydrocolloid sheets sometimes applied in small pieces to reduce wastage. All these dressings, although commonly used in the management of leg ulcers, pressure areas and other types of wounds have not, to our knowledge, previously been reported in the treatment of meningococcal HSL. 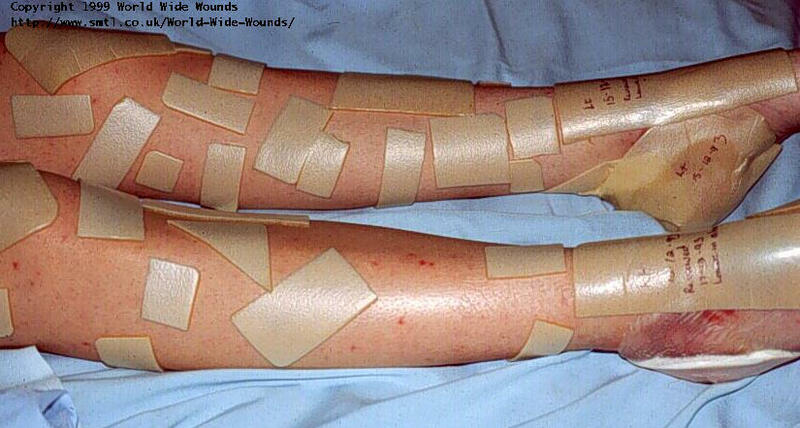 Figure 9: Large number of small pieces of hydrocolloid dressing applied to minor lesions on legs. Dressings on the larger wounds were initially changed on alternate days but later only as dictated by the amount of exudate present. The pieces of hydrocolloid applied to the smaller lesions were left undisturbed for an extended period. By December 21,Chris had improved sufficiently to be transferred back to a medical ward where she was given physiotherapy and provided with splints for bilateral foot drop. By this time she was more alert and naturally concerned about her body image, requiring a lot of psychological support and reassurance. Dressing changes to the hands were time consuming and difficult, although the benefits of this treatment in terms of debridement and initiation of healing were obvious. At this point the hydrogel treatment was discontinued in favour of a silicone impregnated low-adherent dressing, Mepitel - Molnlycke (Figure 11) held in place with a lightweight tubular bandage. This silicone dressing if applied in overlapping layers forms a barrier to water vapour and thus ensures that the wound is not allowed to dry out. This alternative dressing was more acceptable to Chris as it allowed her fingers a greater degree of mobility and enabled her to become more independent. In early January, Chris was allowed home with continued support from the physiotherapy department, the community nursing service and the wound care team but despite making considerable progress she was still weak and debilitated. The larger areas on the heels had lost much of their covering of necrotic tissue although some still remained in the central area of the wound, (Figure 13) By the end of January the remaining slough had come away leaving a granulating cavity (Figure 14), which was dressed with an alginate dressing, Kaltostat-Convatec. The wound went on to heal uneventfully (Figure 15). 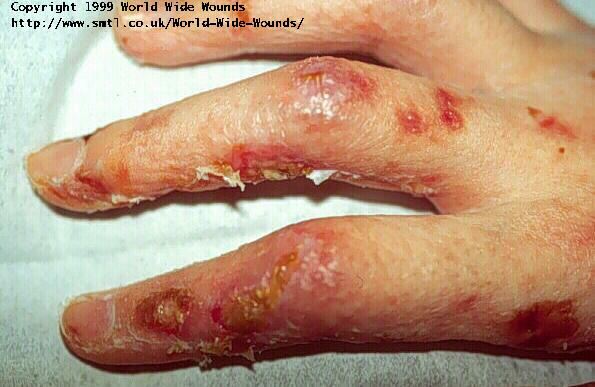 One or two lesions had shown some evidence of over-granulation, but this was successfully controlled by the application of hydrocortisone ointment. The wounds on the dorsum of her feet also continued to make good progress. By the end of January, Chris had also regained full use of her hands which had healed well with minimal scarring and no loss of function. By February, she was walking with two sticks and eager to return to school. She had regained full movement in her left foot although at this stage there was some restriction of movement in the right foot. By March she was back in school part time, able to walk unaided with full movement of both feet. In May all the lesions had healed completely except a small area on her left elbow which also subsequently resolved uneventfully. Chris subsequently made a full recovery and now leads a normal active life, despite the severity of her original illness and poor prognosis. It has been suggested that it is not always possible to predict, by means of a simple visual examination, the eventual degree of tissue loss that will result from a meningococcal skin lesion. Similarly, it is probably not possible to judge accurately the degree of underlying tissue involvement. The traditionally approach of allowing such areas to dry out and demarcate prior to surgery or autoamputation may be appropriate where vascular studies have shown that a significant portion of a limb has become totally ischaemic and will definitely require amputation. For isolated areas or digits where the full extent of the damage cannot be accurately determined, intervention at an early stage with the application of simple dressings that prevent desiccation and the formation of dry eschar must surely be worthy of serious consideration. Such treatments may help to inhibit or reduce joint contracture which, while not as commonly discussed as amputation, is nonetheless an important and perhaps more common finding  . Even though these products have yet to be proven in the treatment of extensive meningococcal HSL, they are widely accepted for most other types of acute and chronic wounds. The current study suggests that this approach offers significant benefits in terms of limiting further damage, facilitating auto- debridement and promoting cosmetically acceptable healing. 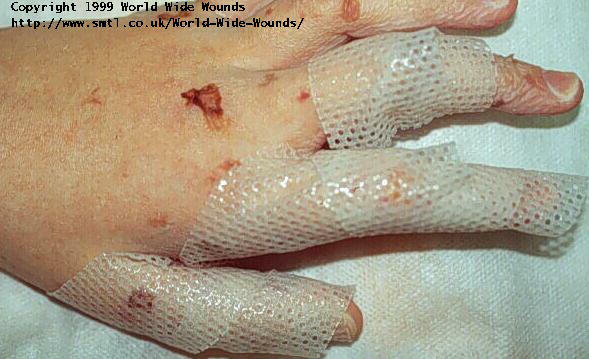 If the areas are considered too large to heal by secondary intention, the dressings will help to clean the wound bed prior to skin grafting. If hydrogels are selected and used in the manner described, their transparent nature will also permit continuous monitoring of the wound area. "The best interests of the young patient will be served by the prompt recognition and early deliberate treatment of this disease while the lesions remain reversible." It is believed that the techniques described in this study are consistent with this advice. The authors would like to thank Dr D Beale, Consultant Physician, Bridgend and District NHS Trust for permission to publish this case history. This article was first published in the Journal of Wound Care, 1998, (7)10,503-507, and is reproduced with permission. 2 - Brandtzaeg, P., Dahle, J. S., Hoiby, E. A. The occurrence and features of hemorrhagic skin lesions in 115 cases of systemic meningococcal disease. NIPH Ann 1983; 6(2): 183-190, 202-183. 3 - Fishbein, R. H. Purpura fulminans: an analysis of the lesion and its treatment. Journal of Pediatric Surgery 1969; 4(3): 320-329. 4 - Grogan, D. P., Love, S. M., Ogden, J. A., Millar, E. A., Johnson, L. O. Chondro-osseous growth abnormalities after meningococcemia. A clinical and histopathological study. J Bone Joint Surg [Am] 1989; 71(6): 920-928. 5 - Darmstadt, G. L. Acute infectious purpura fulminans: pathogenesis and medical management In Process Citation. Pediatr Dermatol 1998; 15(3): 169-183. 6 - Davis, C. E., Arnold, K. Role of meningococcal endotoxin in meningococcal purpura. J Exp Med 1974; 140(1): 159-171. 7 - Powars, D., Larsen, R., Johnson, J., Hulbert, T., Sun, T., Patch, M. J., et al. Epidemic meningococcemia and purpura fulminans with induced protein C deficiency. Clin Infect Dis 1993; 17(2): 254-261. 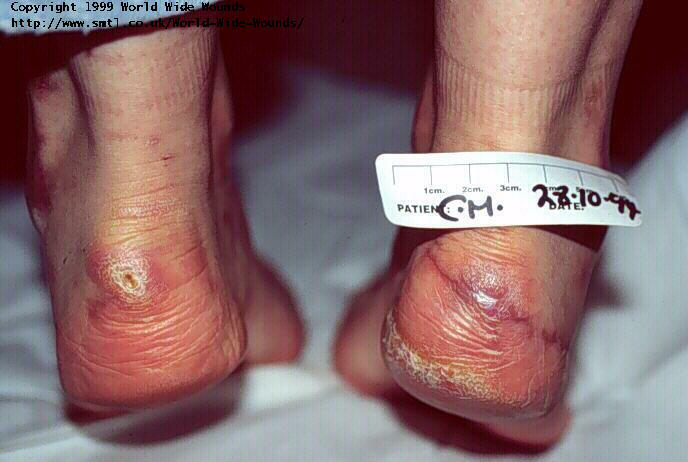 8 - Lazaro, L. d. Gangrene of the fingertips in meningococcemia. South Med J 1971; 64(8): 1018-1019. 9 - Hogan, M. J., Long, F. R., Coley, B. D. Preamputation MR imaging in meningococcemia and comparison to conventional arteriography. Pediatric Radiology 1998; 28(6): 426-428. 10 - Genoff, M. C., Hoffer, M. M., Achauer, B., Formosa, P. Extremity amputations in meningococcemia-induced purpura fulminans. Plast Reconstr Surg 1992; 89(5): 878-881. 11 - Schaller, R. T., Jr., Schaller, J. F. Surgical management of life-threatening and disfiguring sequelae of fulminant meningococcemia. Am J Surg 1986; 151(5): 553-556. 12 - Erickson, L., DeWals, P. Complications and sequelae of meningococcal disease in Quebec, Canada, 1990-1994. Clinical Infectious Diseases 1998; 26(5): 1159-1164. 13 - Fitton, A. R., Dickson, W. A., Shortland, G., Smithies, M. Peripheral gangrene associated with fulminating meningococcal septicaemia. Is early escharotomy indicated? 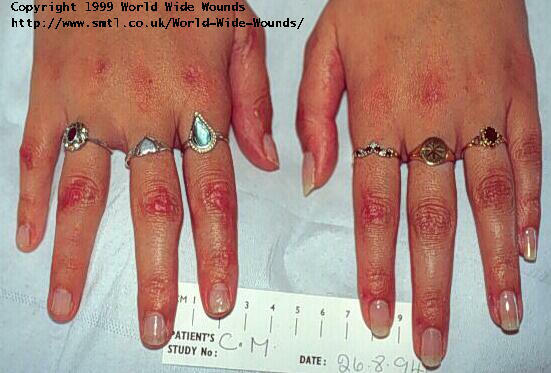 J Hand Surg [Br] 1997; 22(3): 408-410. 14 - Waddell, W. B., Saltzman, H. A., Fuson, R. L., Harris, J. Purpura gangrenosa treated with hyperbaric oxygenation,. Journal of the American Medical Association 1965; 191: 971-974. 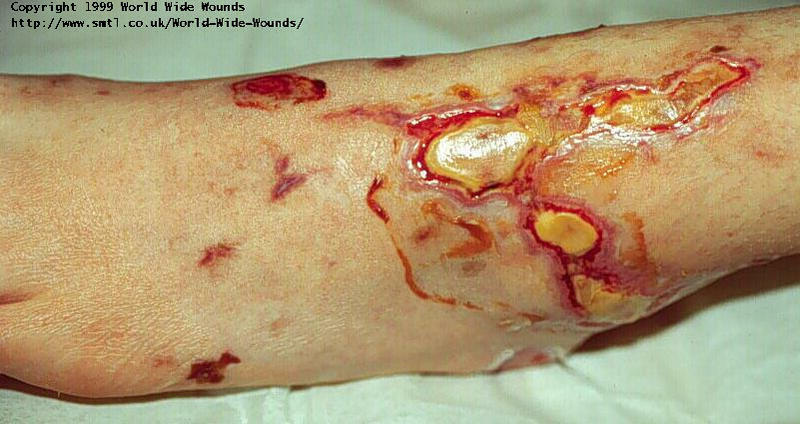 15 - Reinstein, L., Govindan, S. Extremity amputation: disseminated intravascular coagulation syndrome. Archives of Physical Medicine and Rehabilitation 1980; 61(2): 97-102. 16 - Chenaille, P. J., Horrowitz, M. E. Purpura fulminans: A case for heparin therapy. Clinical Pediatrics 1989; 28: 95-98. 17 - Duncan, J. S., Ramsay, L. E. Widespread bone infarction complicating menigococcal septicaemia and disseminated intravascular coagulation. Br Med J 1984; 288: 111-112. 18 - Norman, P., House, A. K. Surgical complications of fulminating meningococcaemia. Br J Clin Pract 1990; 44(1): 36-37. 19 - Aiuto, L. T., Barone, S. R., Cohen, P. S., Boxer, R. A. Recombinant tissue plasminogen activator restores perfusion in meningococcal purpura fulminans see comments. Critical Care Medicine 1997; 25(6): 1079-1082. 20 - Smith, O. P., White, B., Vaughan, D., Rafferty, M., Claffey, L., Lyons, B., et al. Use of protein-C concentrate, heparin, and haemodiafiltration in meningococcus-induced purpura fulminans see comments. Lancet 1997; 350(9091): 1590-1593. 21 - Rintala, E., Seppala, O. P., Kotilainen, P., Pettila, V., Rasi, V. Protein C in the treatment of coagulopathy in meningococcal disease. Crit Care Med 1998; 26(5): 965-968. 22 - Arevalo, J. M., Lorente, J. A., Fonseca, R. Surgical treatment of extensive skin necrosis secondary to purpura fulminans in a patient with meningococcal sepsis In Process Citation. Burns 1998; 24(3): 272-274. 23 - Addendorff, D. J., Lamont, A., Davies, D. Skin loss in menningococcal septicaemia,. British Journal of Plastic Surgery 1980; 33: 251-255. 24 - Huang, S., Clarke, J. A. Severe skin loss after meningococcal septicaemia: complications in treatment. Acta Paediatr 1997; 86(11): 1263-1266. 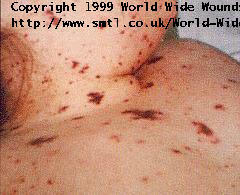 25 - Lester, R. Wound problems resulting from meningococcal septicaemia. Journal of Wound Care 1992; 1(2): 24-25. 26 - Thomas, S., Rowe, H. N., Keats, J., Morgan, R. J. H. A novel approach to the management of extravasation injuries in neonates. Pharmaceutical Journal 1987; 239: 584-585. 27 - Welchon, J. G., Armstrong, D. G., Harkless, L. B. Pedal manifestations of meningococcal septicemia. Journal of the American Podiatric Association 1996; 86(3): 129-131.